I got this great children's book sent to me the other day. 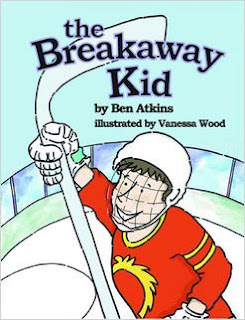 Published back in 2005, author Ben Atkins and illustrator Vanessa Wood teamed up to give us The Breakaway Kid. It is a story about a young boy, Dylan Taylor, who is determined to play hockey despite losing a leg in an accident. Those of us with kids know how negative they can be. So if you are looking to eliminate the word "can't" from their dictionary early on in life, this is a good book to do it with. This is an inspirational story, very well written and beautifully illustrated, with a great message from several angles. Dylan is a positive kid who just wants to be like everyone else. He won't let anything stop him from doing what he wants to do, not even a lost leg. If he can do it, why can't I? His parents set the example and are very supportive. They show how we can all lead our children to achieve their dreams. His classmates and teammates are quietly skeptical but soon won over by admiration for Dylan. I especially appreciated how the author took the time to send the message out to us that just because someone is different does not mean we should treat them any differently. This is a good children's book for the young hockey fan in your family. It allows you to interact with your child and talk about the lessons of life this book offers. The book is suggest for ages 9-12. At 32 pages, much of which is illustrations, I would suspect kids 5-8 would also really enjoy this book, too. Especially if Mom or Dad was reading it to them.